Yesterday, we bid a sad farewell to Reverend Marshall, who has been a governor at the school for the past 8 years, as he retires. The children thanked him for all his hard work, prayed for him and presented him with a gift and a lovely card that they had made. Reverend Marshall led an assembly entitled “Hello, Goodbye’ and told us about his new house in France. We wish him and his wife happiness in the future. 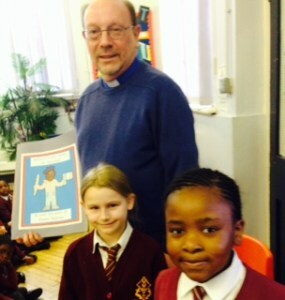 Reverend Marshall is presented with his card. We had a small group of parents for the homework Parent Voice, but the session was still very useful and we had a spread of parents from across the school. Lots of aspects of homework were discussed and I will feed back to you on act action we will take in the near future. Unfortunately, the planned tournament had to be postponed due to the weather. We will let the relevant parents know when it is rescheduled. Mrs Buckley has been busy completing her qualifications to be a Forest School Leader. She held her first session at the school with a small group of children, who thoroughly enjoyed it. Forest School is an exciting approach to outdoor education and we hope to eventually role out the scheme to Reception and KS2. Key Stage 1 will start their whole class sessions in the summer. I apologise to parents who have been upset or offended by my comments about parking. I am aware that not everyone parks irresponsibly and most of you are respectful to our neighbours. In future, we will try our best to approach people individually. There are still spaces in choir if your child wishes to join. It would be fantastic if we could have a full choir for our concerts and events to take place after Easter. ‘Shoop’ looks forward to seeing you! I have been talking to a new uniform supplier this week, as so many parents have complained about the poor quality of our current uniforms. The website should be ready next week (uniforms can be ordered online or bought from their shop in Basildon) and the suppliers will make up some samples for you to look at in the next week or so. The suppliers are called Red Oak Roller. Congratulations to Neve Collins who achieved a Gold certificate before half term for excellent classroom work and behaviour. Once again, 3 out of 4 classes have exceeded the Local Authority target of over 96% this week: Class 3 had 97.92%; Class 2 had 99.17% and Class 4 a magnificent 100%. Well done! There will be no newsletter next week, as I will be on a conference. Please look on the school website for any updates. Thank you for your understanding.